Oh boy! The Impossible Knife of Memory drove a knife right through my heart. What a heart wrenching novel. 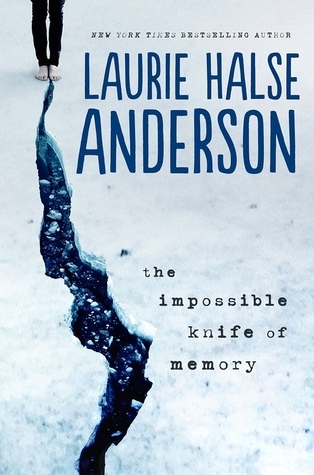 Laurie Halse Anderson can truly do no wrong. She knows how to pen those raw, realistic characters, and pairs them with realistic plots that can be haunting, and beautiful all at once. Anderson delivers a compelling novel with a plot line shining light on a situation that is an issue in many homes: PTSD aka. Post-Traumatic Stress Disorder. You are hearing more and more on the news of brave soldiers returning home and then having to deal with PTSD. It's sad, but as Anderson has proven in her books, it's real. This actually happens. And families and kids have to deal with this just like Hayley herself had to do. It's devastating. A simple writing style that has a lyrical flow makes Hayley's story bounce right off the pages and surround you. Delivered in such a way that makes you feel as if you are Hayley's dear friend, a confidant. What a privilege. Realistic and raw. Heartbreaking and funny. This book was a genuinely beautiful experience! That was a great and comprehensive article…all the tips enumerated and explained will be helpful for those who are wise enough to tap from it. Any business nowadays without social media signals and presence may not make it to the outermost, and investment too is part of the key to success in business. Keep up the good work. Wants to know about emily wickersham as bishop ncis tv series: a talented special agent an American tv serial? Visit our website. يظهر أن العديد منا يتطلبون إلى الوقت المحدد ويحتاجون إلى العثور على أساليب للقيام بمهامنا بشكل سريع أضخم. ذلك صحيح مما لا شك فيه في نسق التنظيف المنزلي لدينا. لحسن الحظ ، هناك اختصارات وأدوات وأساليب تساعدك على التنظيف بشكل سريع أضخم.